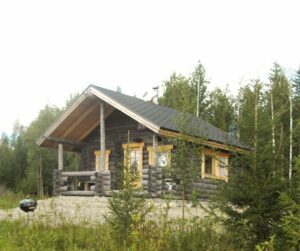 A 80 sq.m log-built cottage completed in 2009. Quiet location on the lake shore, about 55 km from the central village of Ranua. The cottage has ample conveniences (including a ceramic cooker, microwave and fridge-freezer with ice cube maker) and a luxurious 6-person hot tub on the shore. Guests also have the use of a boat and fishing nets. 1 bedroom, loft and lounge. Sleeps 6, kitchenware included for 6 persons. This splendid and spacious seven-bedroom villa is situated in rugged lake landscape, surrounded by wilderness. The 500 m2 villa contains seven bedrooms with a total of 20 beds. There are large lounges with fireplaces and pool tables, a kitchen and dining areas, and a special sauna section with an indoor jacuzzi and outdoor hot tub on the terrace. The amenities include a separate, fullyequipped karaoke bar, which can be converted into a cinema, for example. The upstairs meeting room has 20 seats around a large table. A wireless network connection guarantees a complete meeting experience. The large yard features a private sandy beach, a beach volleyball court, a large barbecue hut, a big sauna and large piers that can even accommodate a hydroplane. A sturdy fence and camera surveillance ensure on-site security and privacy. 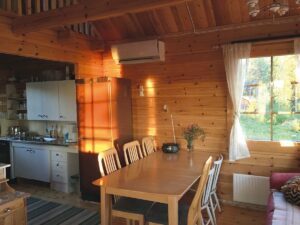 A comfortable 30 sq.m log-built cottage along Simojoki river that sleeps 4. ere is excellent shing in the river (salmon, trout and grayling). The cottage has an electrically heated sauna. In the summer, the lakefront sauna and a boat are also available. The rent includes a fishing permit for one person. 29 km from the Ranua Wildlife Park, 32 km from the central village of Ranua. 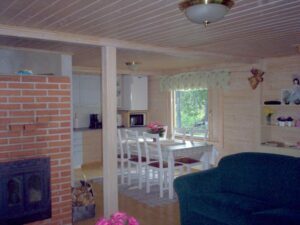 The two-storey 120 sq.m villa by Lake Ranuanjärvi, completed in 2001, off ers modern conveniences for 8+2 persons. Downstairs: toilet, washroom, sauna, lounge, kitchen and bedroom. Upstairs: four sleeping alcoves and a Tulikivi fi replace. In the summer, the rent includes the use of a canoe and a rowboat. In the winter, snowmobile rental is available. Excellent opportunities for skiing and other activities close by. A shallow, hard-bottomed beach. 9 km from the Ranua Wildlife Park, 6 km from the central village of Ranua. 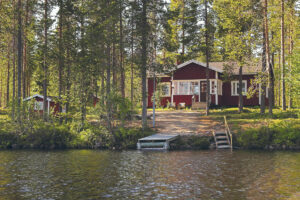 A pleasant cottage (sleeps 6 + 4) with a sauna by Lake Simojärvi. Guests can enjoy boating and fishing guided by a skipper, who tells stories about local life. Two holiday cottages (each sleeps 4) on the lake shore near a variety of recreation opportunities: shing, berry picking, hiking and hunting in the summer, easy access to ski tracks and snowmobile routes in the winter. 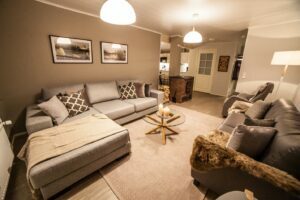 The cottages each have a lounge and a bedroom, a heat pump for heating and cooling, a fully equipped kitchen and a sauna. Guests have the use of a barbecue shelter and a boat on the shore. Tarujärvi Cabin is by the River Simojoki at Raiskio in a peaceful place. Cabin has electricity and can be used all seasons. Dressing room and sauna can be accessed from the terrace. Wood-heated sauna provides enjoyable bath. Sheets are included, but please remember to bring your own towels. Rowing boat can be used by visitors. Woods are on site. Toilet is an out room. This property is 12 minutes’ walk from the beach. Offering free bikes and barbecue facilities, as well as a garden, Villa Havula is located in Ranua, a 15-minute walk from Ranua Wildlife Park. The accommodation features free WiFi. The apartment consists of 3 separate bedrooms, 1 bathroom, and a seating area, beds for max. 8 persons. The kitchen features a dishwasher and an oven. There are also snowmobile routes close by. 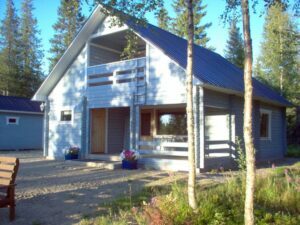 By the Lake Kortejärvi, on the peaceful and naturally beautiful location, Villa Huilinki can be found. 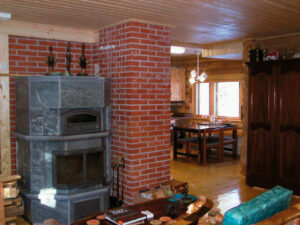 Modern villa is equipped with indoor kitchen, comfortable living room and sauna with a lake-view. On terrace, a dining area, a barbeque and smoker can be used during summer. Right next to the villa is a sauna, with electric sauna stove, and with a dressing room that can be used for additional space for sleeping. Beach is child-friendly and on the yard is a playground for children. For the enjoyment of guests, are also boats, sup-board, kicksled, toboggan and snowshoes. Ask for bathing tub. Snowmobile routes and lean-to are close-by. This 3-bedroom residence is designed with a real fireplace in the center of the open plan living, dining, and kitchen area. Sauna takes a central place in the middle of the house to spread coziness and warmness throughout in the harsh but magical winter. 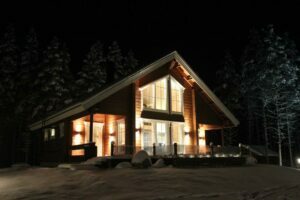 Glass windows are installed on all sides to lend a nature view and northern lights image to the abode. 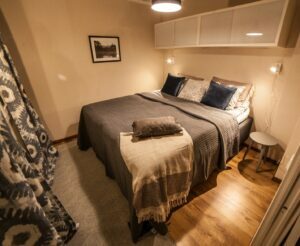 The Haistila has 3 bed rooms with high-quality beds for 9 adults and children. 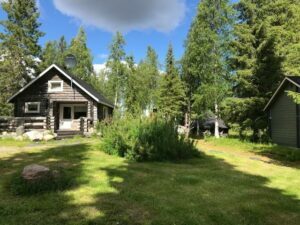 The Arctic Dreams House’s reindeer farm nearby as well as available equipment for different kinds of activities from standup paddleboards, snowmobiles, bicycles, a boat, snowshoes, a quad bike, fatbikes etc, will give you an unforgettable experience. 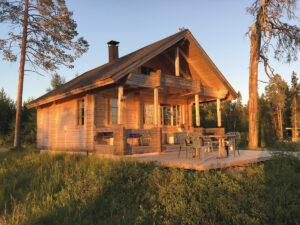 The structure of the area – a main 2-floor wooden cabin from 2010 that is situated in a thriving green area with private yards, a separate wooden garage and a lovely sauna by the river. The main building is characterized by large spaces, an open living, dining, and kitchen area, bedrooms, bathroom and indoor sauna. On the first floor there’s beds for 5 people, and 8 beds for adults and children on the second floor. (The stair is deep, not suitable for reduced mobility people to stay on the second floor). In summer, light flows in from all sides of the house, all of them with full-height glazing. 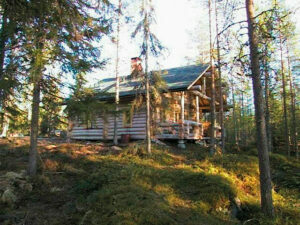 Jontola log cabin is located in Raiskio, Ranua. Cabin accommodates 5 persons. 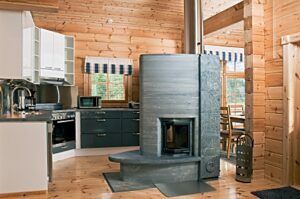 This well-equipped cabin has two bedrooms, separate sauna building with lounge, summer kitchen and hut. 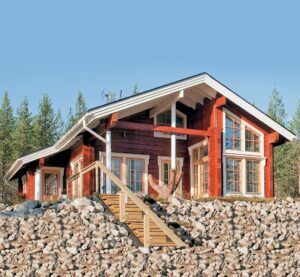 Location by the River Simojoki makes it easy to fish, and surroundings are fit also for biking, skiing and hiking. Reception is available 24 hrs and they will be glad to give tips for what to do in the area. 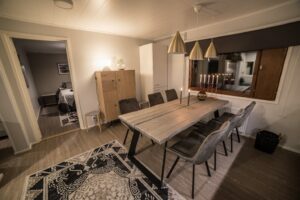 Close to the center of Ranua, you can find a unique destination – Villa Seppälä. 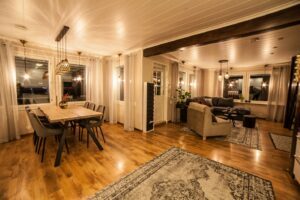 Villa Seppälä is over a hundred year-old log house with eight beds. The history of building is respected and emphasized in interior design. WiFi, fully equipped kitchen and motor beds will, however, provide you a memorable holiday with modern amenities. Guests can book a traditional Finnish sauna, and during the Summer, there is a private beach in use. The great hall can be reserved for meetings and celebrations, as well. Remember to ask about the seasonal activities, the family owning the house will be happy to take you to pick up berries, snow-shoeing and ice-fishing. 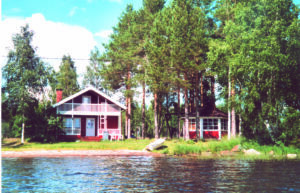 Rantavitikko villa is accommodating 10 persons (max 14) by the Lake Simojärvi. This two-storey villa is built in 2008 and has space for large group. Modern kitchen, four bedrooms, electric sauna and large terrace going round the house guarantee comfortable stay. Villa has airconditioning and heated floors. Close-by right on the shore is a separate “Grand dad’s cabin”, which offers more beds with its bunkbed, double bed and sofa-bed. Cabin has fireplace, kitchen, warm and cold water but there is no bathroom and WC in the cabin. Wood-heated sauna is also right by the lake. There is a hot water pot in the sauna. Dressing room is electrically heated. There is also a spacious terrace around the sauna. Beach is suitable for children.